Getting posy in the cold! I was in Manali for a break, a long break of 10 days, taken after 6 years. Away from internet, Whatsapp and email, I had with me 4 books to read and the awe inspiring mountains to see. Everyday I would wake up and see fresh snowfall on the peaks. I would compare this with the amount of snow I had seen on the previous day and smile at the sheer beauty of the landscape in front of me. On some days, the clouds would come down as if playing hide and seek with the peaks; they would offer a sneak peek of the mountain top and then cover them soon. This happy routine combined with reading went on for a week. 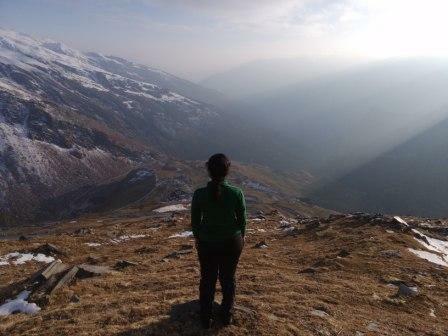 And then the trekker in me, refreshed with all the rest, got excited about trekking in the mountains. So off I went to find out about some day treks, since I had 2 days before my return. I met Ravi Thakur from Himalayan Caravan Adventure. 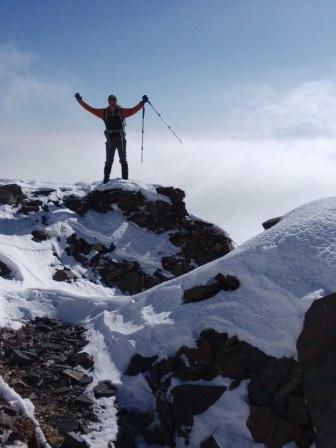 He gave me multiple options from Mt.Patalsu peak, Lomadugh, Lake Dashaur and Hamta Valley. I instinctively picked the trek to Dashaur Lake. 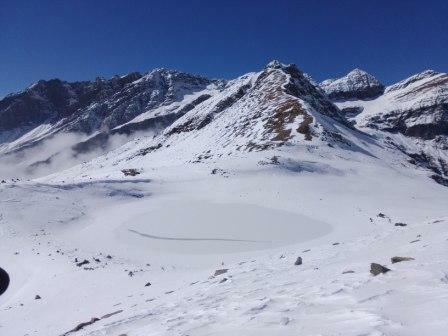 Since it was the last week of October, the higher regions of Manali had received snowfall and there were chances that the lake could be frozen. It is 3 years since I completed the Chadar Trek (walked on the frozen river) in Ladakh and I was very excited. This was followed by a list of instructions from Ravi. Wear layers for the trek. Carry your glares, gloves, a woollen cap and extra pairs of socks incase they get wet. We may require gaiters for the trek, which he told me would be provided by his company. The next morning, I packed my day pack. It contained a bottle of water, sunblock with a SPF 50+, an extra cardigan incase I felt cold and my tablet to take pictures. At 7:30a.m. we started off for Rohtang. It is a picturesque drive of 2 hours, where we passed by Bahang village. Enroute I saw ponies grazing on the mountains, prayer flags strung between two trees, carpets of leaves in colours of autumn, surreal views of mountains covered in snow. There is work going on to widen the road. We also saw locals working on building the road and many trucks transporting essentials to and from the difficult terrain. The route is winding along the mountains. Therefore, it is better to drive on a light stomach. Before starting out, my snack included 2 dates and a piece of Cadbury Silk. Just as the sun began to rise, it formed a golden outline behind the mountain peaks. At every turn, the play of light and shadow on the mountains was mesmerizing. Up until now, the windows of the car were rolled up. Then we stopped at a dhaba enroute for breakfast. As I stepped out of the car, I was literally blown away. The wind outside was having a fun time blowing away. I pulled my cap closer to cover my ears, zipped my jacket all the way up and walked in for a cup of chai and omelette. There is something about pahadi chai (Tea in the mountains). It could be the flavour of ginger or a hint of jaggary probably. It warms you up instantly and feels so good. Another drink that is popular in Manali is Ginger Lemon Honey. It goes perfectly at the start or the end of any meal, when the temperature is around 5°celcius or less. The dhabas here were named after regions in the valley, there was a Kangra dhaba, Chamba dhaba and so on. As we stepped in to Mansarover Dhaba, the song, Mera Ghagra with Ranbir Kapoor and Madhuri Dixit was playing on the television screen. This was followed by a host of Bollywood dance numbers. The music helped moving about and staying warm amidst the cold winds blowing outside. It is here that I realised how item numbers help stay warm! With a quick round of carbohydrates and proteins, we quickly got into the car and continued the drive further up. I then realised the intensity of the wind when bushes outside were not swaying, but they were pushed onto one side with the pressure of the wind. At times like this, it is inspiring to see people work towards building the road in extreme conditions. The depth of the human spirit is simply unimaginable. Around the curve, I heard the sound of water, only to be greeted by a waterfall ahead. As we drove, there were parts of the road which had stalactite like formations of conical ice hanging down from the rocks. At every point, I wanted to stop to take a picture and then I realised it is best to capture it in my mind and enjoy the journey. I admire travel photographers and travel bloggers all the more now, because showcasing every moment of your travel while experiencing it, is not an easy task. A little ahead of the Vyas Rishi temple in Rohtang, was the starting point of the trek. All I could see in front was these huge towering mountains covered in snow. Ravi handed over the gaiters and 2 walking poles. Gaiters come with a loop that goes under the soles of your shoes, clipped on to the shoe lace in front and they extend all the way up your calf to ensure you stay dry if there is water or snow. I strapped my day pack on my back, put on my gloves and I was all ready to trek up to the frozen Dashaur Lake. I have seen snow before, walked on snow even. But walking on a steep mountain covered with snow is a different ball game altogether. So here I was taking steps gingerly, taking support with the poles and treading very carefully, being afraid lest I fall. The wind was still very strong and I couldn’t see a trail to walk on. Before I could express my fears, Ravi told me to let go of my fears and take faster steps. He demonstrated with the sure footedness of a local pahadi (mountain man) and counted 1, 2, 1, 2 as he stepped with the right foot and then the left. I followed in his footsteps, slowly increasing my pace. Since the climb was continuously uphill, we had to stop every 20 to 30 steps to recover and get used to the light mountain air. 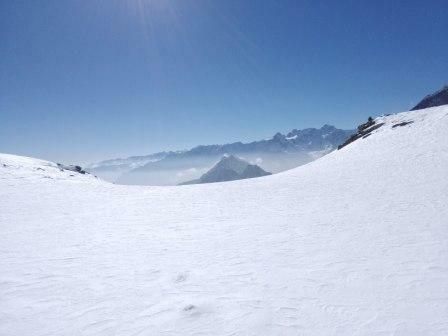 All I could see in front of me was this white landscape and as we climbed higher, the view only got better. I asked him the direction in which we had to go and in true mountain style, he pointed to one of the mountains up above, told me we have to go to the top and cross over, walk down that mountain to reach the lake. It sounded so simple, in reality, it was just the opposite. There were moments where the slope was really steep and I felt my body lean to one side to avoid falling. Enroute, Ravi also taught me techniques to walk in snow. While going uphill, take small quick steps. Dig your heels in the snow to get a better grip while going down. This was just the start of many lessons in mountain climbing. 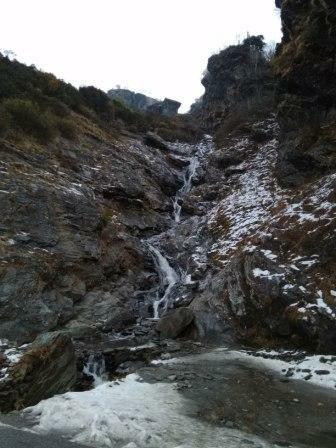 As we walked ahead, I saw a frozen waterfall. At this moment I had to pause and take a picture. 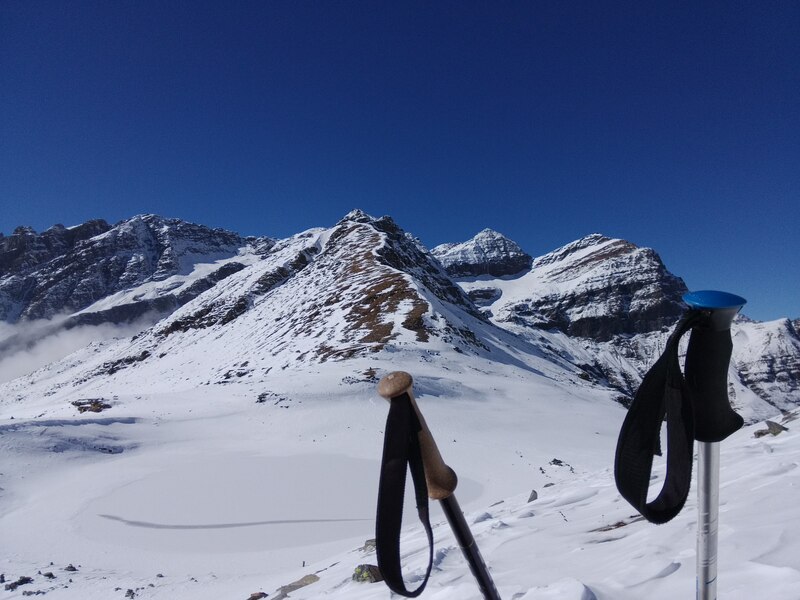 Trying to balance myself, I grounded the walking poles in the snow and removed the tablet to click a picture. There is some connection I share with waterfalls. It is also my theme for collecting philatelic stamps. Picture taken and confidence levels little better, we walked ahead. With Ravi’s counts of 1, 2, 1, 2 …. I remembered the teaching in my Yoga class, where Radhika tells us to focus during meditation using the mantra Sohum in sync with our breath. I tried to implement this in taking steps forward and it sure gave me the courage to move ahead. Just as I thought I was doing fine, Ravi pulled out the rope and connected the two of us with it. That is when I realised that the climb ahead was only getting tougher. The rope served two purposes. One being, it would pause the fall incase either one of us slipped enroute. Two, it let me use it as a support to gain momentum in my pace. For a part of the trek, we were a two man train, walking in sync, with me using the rope as a support. I realised the finer differences between being winter ready and snow ready. Similarly, being fit is one thing and then being snow fit calls for much more. Taking sips of water enroute, we continued the upward climb. Then just like with other treks, there was a stretch I will remember for long. It was a challenging path, with a big rock to climb over to get to the top. It is not just important to be sure footed, but equally important to have arm strength to pull yourself up. This patch also called for stretching the length of the step much more than normal to climb over the rock with limited foot holds. There was a point where I thought I am stuck, amidst snow and rock, in a precarious position, holding on for dear life. And then, rather than being scared, you have to tell your mind to focus, apply logic and synchronise it with your steps. Before I knew it, I was out of that patch and we continued trekking. A pat of the back by Ravi sure helped me feel good about what I had just done. 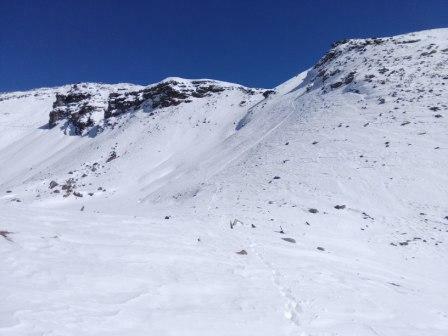 We finally reached the part where the summit of the mountain we had to cross was approximately 50 metres away. There was a small flat land with stones balanced on one another. From here, when I looked around, the view was simply white, this beautiful canvas of snow mountains all around. By now, the wind had reduced and with all the uphill walking, the body had warmed up. I could open up the jacket zip to increase breathability. At times like this, I wish there is an organic substitute to the resilience of nylon or polyester that is used to make shell jackets. Well, I had to put that thought on hold and walk up the last few steps of the upward climb. Enroute Ravi pointed out to what looked like a trail of paw marks. He suggested we might get to see a bear of a wolf. What lay ahead though was a steep slope downward towards the lake. It was time for some more mountain climbing lessons. Ravi told me to dig my heels into the snow while going downhill. I dig my right leg, then my left, a few more steps and boom, I slipped to fall down! I tried sliding down the slope reminiscing a slide we used to sit on in school. Ravi kept instructing me to slide slowly with control. At the end of the downward slope, I thought I saw a flat patch for walking. Excited at the ease of the walk, even contemplating running, the mountains surprised me yet again. The snow was about 1 feet deep. Walking in that deep snow requires alot of leg work, pushing down, lifting up, pushing down again and so it went till that stretch of flat land ended. I looked back and actually spotted the trail we had taken to reach there. 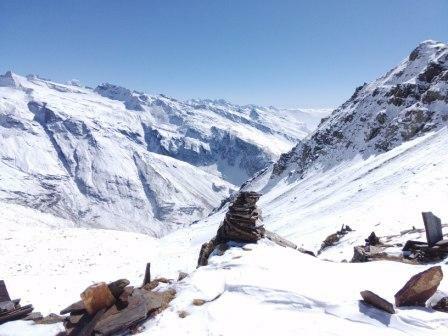 Another short climb atop a hill and there … I saw the first glimpse of frozen Dashaur Lake. Calm, serene with a smiling arch that showed the water beneath the white layers of snow. Ravi told me that the locals from Manali consider the lake to be holy. They come to pray during their festivals. Eating near the lake or going close with shoes was not allowed. With the fatigue of the 3 and a half hour climb uphill, the sheer disbelief of the beauty ahead of me and the thought of the climb down, I asked him if we could sit for a while! I dug my poles in the ground ahead, removed my jacket and sat down. The challenge of the climb was yet to sink in, but that could wait. We clicked some pictures, had a sandwich and some juice. I still couldn’t believe that here I was atop a mountain, in the midst of snow, overlooking a frozen lake. I could only close my eyes in gratefulness for this amazing experience. In sometime, we started seeing clouds come down. Ravi suggested we start moving, lest we come across a white out. This happens when it gets misty and the vision is reduced to less than a few metres in front. With no trail to follow, this was not a scenario we wanted to be in. Although the calves were starting to complain, I quickly got up and got ready to leave. As we walked down, I saw a blue halo around the sun. And it was easy to look at the sun with the glares. The rays of the sun were not hurting the eyes and it was visible like this yellow white sphere with a blue ring around it. Closer to the lake, we took a couple of more pictures. The mountain range through the downward arch of the mountains made for a beautiful frame. As we started the descend down, the clouds got more dense. We were walking towards the left and the view on our right was completely engulfed in mist. I prayed and hoped that the climb down goes smoothly. 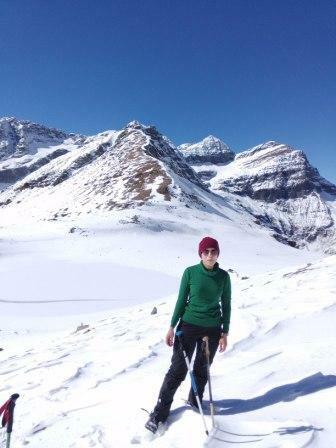 Some more knee deep snow, pushing and lifting up with sohum giving me the strength to go forward. Up ahead lay a slope that was steep again and Ravi told me that I cannot slide down since there was nothing that could stop me if I lost control. He suggested I hold on to the side straps of his backpack and follow him down. I was suppose to keep my weight back and not lean forward while holding the straps. Figuring my way for the first few steps, I got a hang of going downhill holding the bag. This was followed by some relatively easy stretches, where I did test what I had learnt. Dig your heels into the snow, walk sideways, take diagonal steps. There were moments when the fatigue took over the fear of falling down. I was too tired and wanted to complete the trek, that there was no scope of being scared. I just had to walk ahead. And then again, in stretches the fear was back again and I asked Ravi for help. It was as if both fatigue and fear were playing hide and seek with me. Just when I thought I was reaching the last bits of my stamina, after a tough trek of over 6 hours, the mountain took a turn, we could see the road and the walk towards the road consisted of a dry grassy hill. I heaved a huge sigh of relief and just stood there standing for really long. With this last stretch, the trek would be over, our car was waiting down to drive us back and I had nearly completed the trek. The feeling was overwhelming to say the least. As I was taking in the magnanimity of the mountains, the big issues I left back in the city seemed irrelevant. And as I was in my thoughts, the mountain climbing lessons were back. Ravi instructed me to walk in the direction of the grass. Walk diagonally while coming down. Relieved, happy, confident and tired all at the same time, I tried jumping a couple of times to test my skills and to reach down faster. At other times, I was careful and followed his instructions to the tee. As the road kept coming closer, I could see our car waiting below. Finally, we reached the road, crossed over and walked towards the car. I removed the gaiters, gloves, jacket and handed over the poles to our driver. We sat for a while and then started the drive back to Manali. 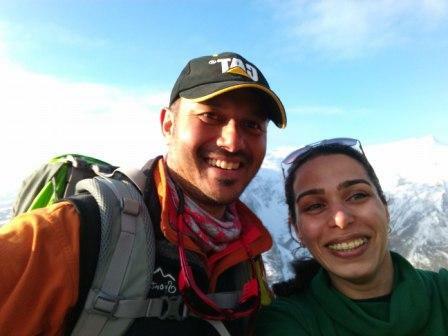 It was surreal to believe that at the start, Ravi had asked me if I am sure about this trek. 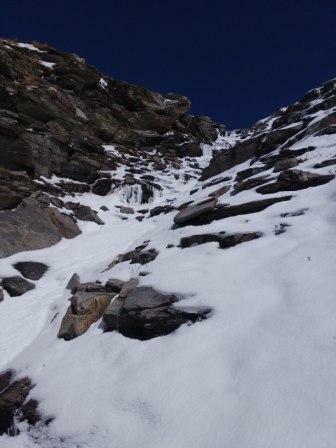 He even suggested trying out something else, since I wasn’t familiar with walking on a steep mountain with snow. But I wanted to see the lake and so we decided to go ahead. I told Ravi that the trek would not have been possible without his help. He told me that once he knew of my intention to see the lake and he saw my fitness level, he was confident of himself to go through the trek. 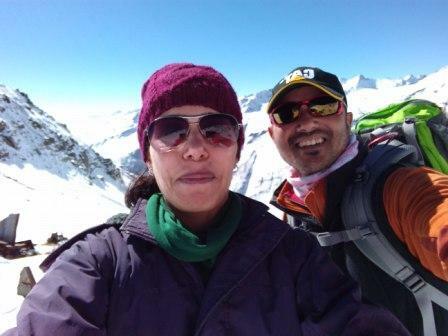 Ravi has done skiing course from Atal Bihari Vajpayee Institute of Mountaineering and Allied Sports, Manali. He has been trekking since the last 18 years and is an active back country snow boarder in surrounding mountains of Manali. Since the last 8 years, he has been perfecting his skills in rock climbing and bouldering. The drive down was faster than the drive up. We started from the base at about 5p.m. and reached Manali by 6.30p.m. The pain in the arms, the calves, a slight pull in the hamstring was all relieved by a hot water shower and a cup of ginger lemon honey. This is one trek that is going to take a while to sink in. Location: Manali is a hill station in Himachal Pradesh, located in the northern part of the Kullu Valley. The Beas river flows through this quaint hill town. It is approximately 350kms from Chandigarh and takes 8 to 9 hours by road to cover the distance. The closest airport is in Kullu, but operations here are dependent on the weather conditions. There are two routes to trek to Dashaur Lake. 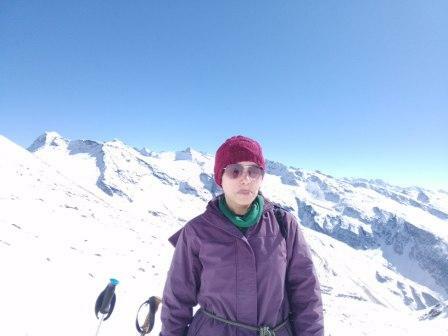 Depending on availability of time and passion for trekking, one can choose to start the trek from Manali to Rohtang Pass and then up to the lake. 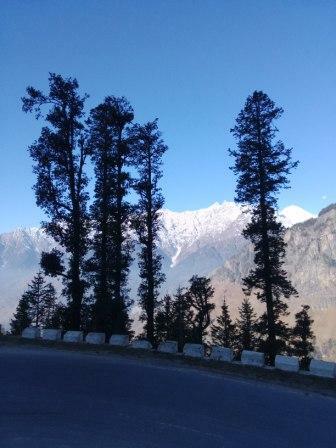 Alternatively, if you choose to do a day trek, you can drive up to Rohtang and start the trek from there. Level of fitness: I would categorise the trek as moderate to difficult. An adequate level of fitness is essential for this trek. Apart from the steep terrain, it is important to get acclimatized to the altitude which is more than 4000 metres above sea level. Being a half marathon runner, I have been running regularly since December 2014. I practice yoga thrice a week combined with strength training on other three days. Camera: Do test your camera before a trip, check the memory card, have the battery fully charged and a protective cover to safeguard it in extreme weather. A tablet is not the best device to shoot pictures with. With the reflection of the sun, there are moments when you are unable to see the view through the tablet’s camera.